How can Attendees Address Questions to a Speaker? Below you can find a list of options of how your attendees can address their questions to a speaker using different app's features. 1. Post questions to the Activity Stream. You can create an admin profile and call it 'Q&A'. The attendees can post their questions on the Activity Stream and address them to @Q&A. Alternatively, the users can address their questions to the individual @speaker. Please note that in this case, the speaker would need to create their personal attendee profile in the app first. 2. Send questions using the Private messaging feature. 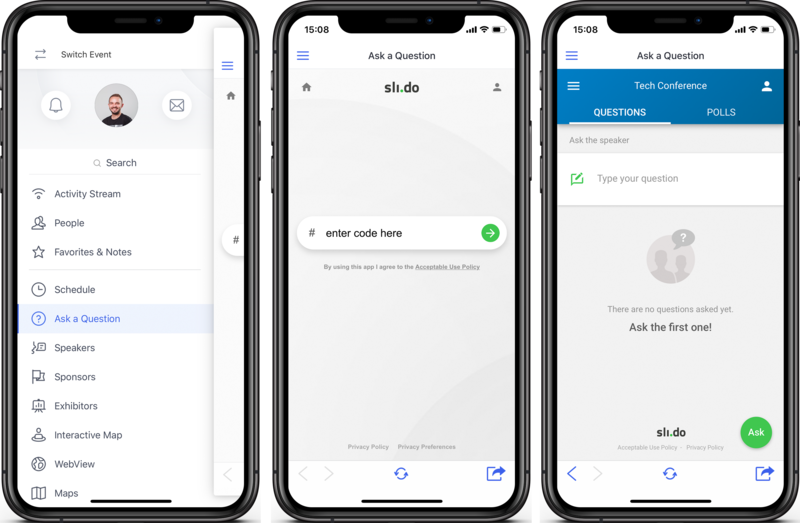 If your attendees don't feel comfortable posting their questions to the Activity Stream, they can send them to the speaker or to you directly via the private message. 3. Incorporate any external service (e.g. sli.do) through the WebView feature. On the Features step, add a WebView feature, rename it to "Ask a Question", for example. Register on sli.do and create your event. Share an event code with your attendees (you can add it in the About section of the app, send a push notification or share it via email). On the Content step, insert your event's weblink.